ORLANDO, Fla.—WJRR’s 22nd annual Earthday Birthday celebration will take place at Central Florida Fairgrounds, on April 25. It will start at 11 a.m. and end at 11 p.m. 12 Stones, All That Remains, Avatar, Bobaflex, Buckcherry, Five Finger Death Punch, Flyleaf, Hellyeah, Islander, Message to Venues, Nothing More, Rise Against, Saving Abel, Sevendust, Slash featuring Myles Kennedy and The Conspirators, Sleepwave, Trapt, and Tremonti are all scheduled to perform. Five Finger Death Punch will be headlining the event. Set times will be released, during the week of the event. 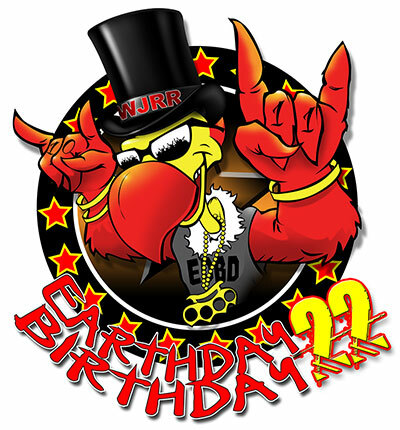 Monday through Friday between 10 a.m. and 5 p.m.
From 9 a.m. and 5 p.m.
﻿Main attractions for the 22nd annual Earthday Birthday include: BMX demonstration, Mel’s Bad Girls Art Walk, the midway presented Al Capone Cigarillos, Tito’s Handmade Vodka acoustic stage and VIP lounge and two stages of nonstop rock. For more information about Mel’s Bad Girls Art Walk and to reserve a spot, please email mel@wjrr.com. For more answers regarding Frequently Asked Questions (FAQs), please click here. Charity partners will be onsite for the 22nd annual Earthday Birthday include: Base Camp, Central Florida Animal Reserve, Children’s Miracle Network, Clean The World, Downtown Arts District Orlando, Heart Strings For Heroes, Hope Helps, Inc., Libby’s Legacy Breast Cancer Foundation, Mel’s Bad Girls Club, Ribbon Riders, Rock Pink and Twisted Ribbons. Sponsors for the 22nd annual Earthday Birthday include: Al Capone Cigarillos, Bright House Networks, Bud Light, Dancers Royale, Dean Guitars, Full Sail University, Gasoline Party In A Pouch, House Of Blues, I Believe In Wrestling, Metro PCS, Mountain Dew Kickstart, Porkie’s Original BBQ, Realm Tattoos, Rock Pink, Sky King Fireworks, The CW 18 and Tito’s Handmade Vodka.